Thandai Kulfi is a rich kulfi and is full of flavours from the Thandai Syrup. If you have some ready to use Thandai syrup, making these is just a breeze. Kulfi or Ice-cream? What do you like more? I prefer kulfi over a scoop of ice-cream any day. This recipe has been there in my drafts for a long while. I had made these to use up the last bits of the Homemade Thandai Syrup I had made for Holi. Since I had not posted anything in a long while here, I decided to share this one to cut short my absence from this space. By the way, have you ever made Thandai Syrup at home? If not, try it the next festive reason - I bet you will never want to buy a bottle of readymade syrup ever. It comes out THAT GOOD. Coming back to the recipe for today, I just used the thandai syrup to flavour and sweeten the thickened milk used for making these kulfis. Since Thandai syrup is already flavoured with nuts, cardamom, saffron, etc., there is no need to add anything more. These kulfi were just perfect - with just the right flavour of Thandai. I am going to make these again whenever I made the thandai syrup. Let's check out the recipe. 1. In a non-stick pan, heat milk. When it comes to a boil, turn the heat to medium and let it simmer till it reduces to about half in volume. It can take about 25-30 minutes. Keep stirring in between and scrap the sides too. 2. Add the milk powder, cornflour mixture and stir well. Heat for another 5 minutes. Corn flour helps in further thickening the milk and thus giving it a creamy texture. Add the thandai syrup and stir again. Turn off the heat. 3. Let it cool down to room temperature and then fill the liquid into the kulfi moulds. 6. Freeze it for 8 hours or overnight. 7. Take the kulfi out of the freezer, 5 minutes ahead of serving. Unmould and serve immediately. I love thandai so much.. I must try out these kulfis next time when I make it. Highly irresistible, feel like grabbing that kulfi and enjoying rite now eventhough the climate is too chilled outside. This thandai kulfi rocks Jyoti. Thanks Priya. Try it during summer months. Thanksdai is my favourite drink in summer.. Must try yjese kulfis made with thandai.. Must be so flavourful. Even I love kulfi more than ice cream. As for this kulfi will try it next season. I too made thndai kulfi this Holi and loved it. It has all the flavors and taste from thadai masala. I agree Kulfi made the traditional way tastes best. Thandi kulfi is much tempting and perfect for this season.. Very easy and healthy kulfi for kids.. Yes, kids will definitely love it. Nothing beats homemade stuff. Sounds delicious and even I love Kulfi than ice cream. Feel like grabbing them... its already hot here and your click is so refreshing for eyes ! anything in thandai flavor is my family's all time fav. Yours one is looking so yummilicious !! Main Nashe mein hoon, mujhko bhi yeh chaahiye, main Nashe mein hoon. Wow! Lovely clicks with super easy recipe. what a great way to include thandai flavors. love kulfi and thandai kulfi is yum. One fav drink turned to kulfi.. Yumm.. Just its the need of the hour now this summer..
What a delicious looking recipe with some fantastic flavours. I have never made kulfi where you add corn flour so book marking it for future reference. 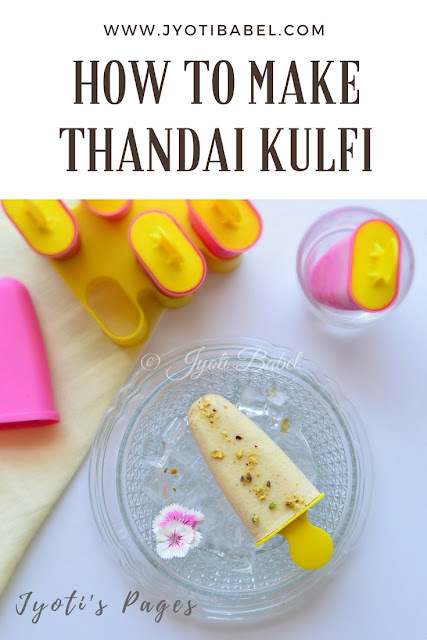 I love Thandai but never tried kulfi as during Holi we still going through winters here:) but definitely this time will try during summer time. Such a tempting flavours! Looks delicious. Had this 5 years back at my friends house. Now that I am vegan I will make with plantbased milk. Jyoti, since this is the first time we have got acquainted via the group, Loved going through your blog and to see your passion towards food. Glad we are connected via the group. The thandai Kulfi is just what I would look for right now as Mumbai is suffering from terrible heat currently. Beautiful post! This looks flavoursome, now with summer approaching these kulfis will be back. Nice share. 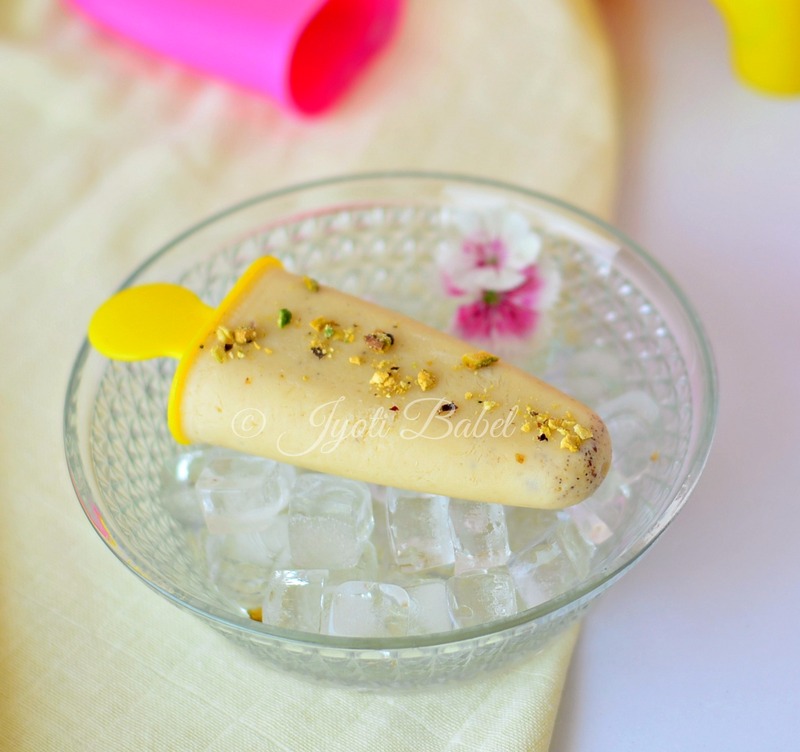 My kids love homemade kulfi / Popsicle and I have been trying out several versions. This one sounds so exotic. Will check out the thandai syrup recipe too. Yes, it is quite delicious. Thank you. Thandai kulfi looks very inviting, and perfect for summer. Going to try this very soon. Clicks are beautiful. Love these Thandai flavoured kulfi!! Fantastic share and perfect for this holi season.Fab clicks too.